Truth Fellowship Live | Bismarck ND Church | How brightly is your light shining? How brightly is your light shining? I have been pondering Matt. 5:16 this week. It reads, “Let your light so shine before men, that they may see your good works and glorify your Father in heaven.” This is an important verse and many of us have memorized it. But, do we often consider what it means to us as saints of Christ. “Saints” is an interesting concept. All who trust in Christ alone for salvation are called saints in the Bible. Perhaps a short story will help us understand, from a child’s perspective, what a saint is. A young boy went with his parents touring around Europe one summer. Part of their tour included visits to the great old cathedrals of the past. As he visited cathedral after cathedral, he was impressed the massive stained glass portraits of the disciples and of other saints as he stood in their great empty halls looking through the beautiful stained glass windows. That is a good definition of what a saint of God is supposed to be. We are people through whom the light shines. We have no light of our own, but like the moon, we are to reflect the light of Jesus to a lost and dying world. As a saint, how are you supposed to let your light shine? 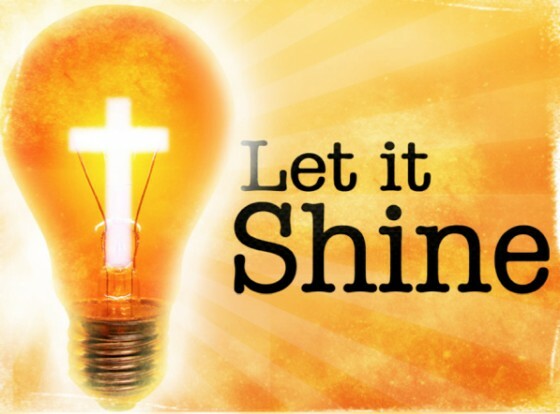 For us to be shining lights, we must first have God in us. This is done only by trusting in Christ to bring us into a relationship with God. There is no way except through Jesus, the Christ, to come into a relationship with God. As humans, we have no light of our own. The only light we have to share with the world is the light that shines through us from God. God is the only light that reveals good versus evil, light versus dark, and truth versus lies. We are to let our light shine. That means we are to live in such a way that people take note of us and wonder (often they will even ask) why we are so different. Our light is to shine before people. It does us no good if we shine and no one is around to see us. We have to be where there are people so they can see God through us. Our shining light should be in the form of good works. God has prepared us to do good works (Eph 2:10). These works are to be done so that people can see Christ through us. We should be demonstrating concern and compassion—genuine care—toward people. Once our light is seen by the world, the world in turn will glorify God. All of what we do should be done to lead others to God. Our shining light and good works are not for our benefit. They are for the world to see God working through us. This exalts God and gives Him all the glory and honor. Would I be found guilty of being a Christian? Would there be any evidence to convict me? Would there be any witnesses to convict me? How did you do? I pray that you would want to be found guilty of being a Christian. No Replies to "How brightly is your light shining? "